After a second assault in less than a week, police investigate to see if they are connected. 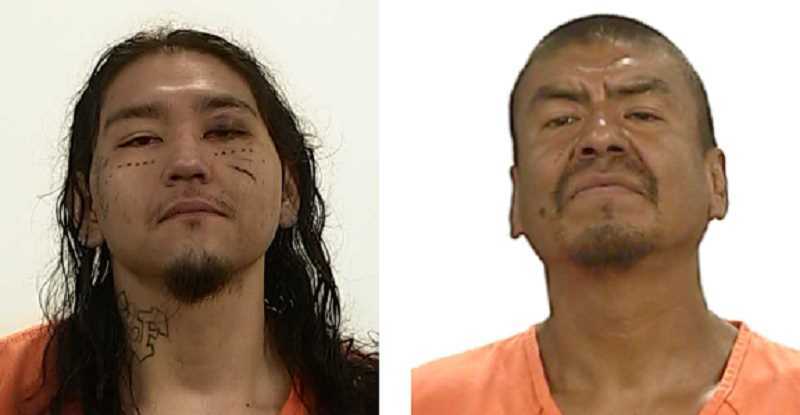 Two men were arrested early Saturday evening in connection with a stabbing — the second in less than a week — that occurred in Madras. Officers from the Madras Police Department were dispatched at about 4:30 p.m. on Dec. 22, to the report of an assault near 11th and C streets, a block north of Madras Elementary School. Police found a 46-year-old Madras man with several stab wounds. The man was taken by Jefferson County Emergency Medical Services to St. Charles Madras, and later airlifted to Oregon Health and Sciences University, where he was initially in critical condition, but was upgraded to serious on Sunday. According to MPD detective Steve Webb, officers were able to identify Devonne James Rhoan, 27, of Warm Springs, as one of the suspects, and obtain a description of another suspect, later identified as Gabriel James George, 44, of Madras. Just after 6 p.m., police were dispatched to an attempted entry into a vehicle just west of the Texaco gas station at Fourth and D streets, where officers made contact with the two men matching the descriptions from the earlier incident. "These suspects refused to comply with commands and were subsequently taken into custody after tasers were deployed on both," Webb reported. "Based on the information obtained during this ongoing investigation, it has been determined both suspects acted together during the previous assault," Webb added. The two men were transported to the Jefferson County Correctional Facility, where they were lodged on charges of attempted murder, first-degree assault, unlawful use of a weapon and menacing for the assault, and first-degree criminal mischief, attempted unlawful entry into a motor vehicle, attempted unlawful use of a motor vehicle, resisting arrest and interfering with a police officer for the vehicle activity. Rhoan was arrested on a no-bail warrant. Security for both was set at $440,000, and they were set to appear in the Jefferson County Circuit Court on Dec. 24. Police are investigating whether or not the assault is related to the stabbing that occurred on Dec. 16, when a 21-year-old man was discovered around 1:30 a.m., with stab wounds, in the parking lot of the Madras Pub and Deli on Southwest Fifth Street. That stabbing was believed to have occurred a short distance away. That victim was airlifted to St. Charles Bend, where he was treated for his injuries and later released. Anyone with additional information is asked to call Frontier Regional Dispatch at 541-475-2201.